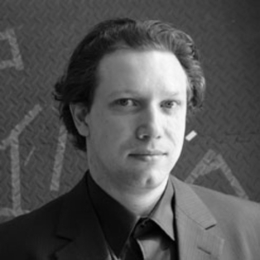 Dr. James Romaine is a New York City based art historian who is an Associate Professor of Art History at Nyack College. He is the cofounder of the Association of Scholars of Christianity in the History of Art. Romaine has an undergraduate degree from Wheaton College in economics and art history, an MA in art history from the University of South Caroline (thesis: A Modern Devotion: The Faith and Art of Vincent van Gogh), and a PhD in art history from the Graduate Center of the City University of New York (dissertation: Constructing a Beloved Community: The Methodological Development of Tim Rollins and K.O.S.). He is a frequent lecturer on faith and the visual arts and has authored numerous articles, in the Art Journal of the College Art Association, American Arts Quarterly, Christian History & Biography, Re:Generation Quarterly, The Princeton Theological Review, Image: A Journal of the Arts and Religion, It Was Good: Making Art to the Glory of God, and Faith and Vision: Twenty-Five Years of Christians in the Visual Arts. His books include Objects of Grace: Conversations on Creativity and Faith and The Art of Sandra Bowden, both published by Square Halo Books. Dr. Romaine is on the board of directors of Christians in the Visual Arts (CIVA). Yayoi Kusama's Infinity Nets: Sublime or Spectacle? Oh, how you will delight the angels!